WP Courseware is one of the easiest courseware management systems within the WordPress plugin options for learning management. It provides easy drag-and-drop arrangement of modules, lessons, and quizzes and includes many integrations with other WordPress plugins. WP Courseware does one thing. It allows you to create courses. All other functionality, like the sale of courses, is managed by other plugins like WooCommerce or a membership plugin. If courses will be sold or additional functionalities required, some planning is required to make sure the product and integrations work as desired. $99.00 for use on up to 2 sites with 1 year of support. $125 for use on up to 10 sites with 1 year of support. $175 for use on up to 25 sites with 1 year of support. E – It is accomplished using an extension (also called an Add-On). 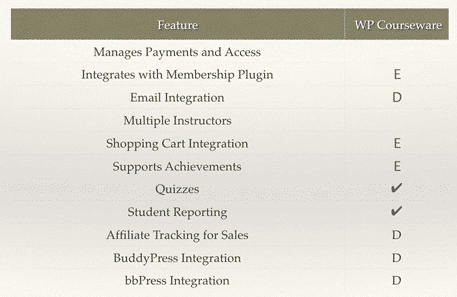 WP Courseware has the most extensions available for integrations with other WordPress plugins. Because all functionality other than the actual course creation and delivery is managed through outside plugins it seems they decided to integrate with as much as possible. Courses can be sold and accessed managed using WooCommerce or almost any popular membership plugin including Paid Memberships Pro, MemberPress, MemberSonic, and more. I personally use Paid Memberships Pro or MemberPress for my configurations depending on the requirements. Payment options are controlled by the shopping cart or membership plugin. Support for Easy Digital Downloads is also included within WP Courseware. The integrated plugins that manage the sale and access to the courses provide options for accepting payments using PayPal, Stripe, and other payment processors. Many courseware programs use their specific terminology to describe the items within a course. In WP Courseware, the course is the top level unit. Within this modules are created as organizational areas to hold the course lessons which are called units. The following information is an excerpt from my How to Build an Online Course using WP Courseware class which re-launches in March 2016. Make sure you’re on the mailing list to get alerts when the course launches. Creating a course in WP Courseware is as easy as creating a blog post or page with a few additional settings. There are several Settings tabs across the top that you will need to complete before moving on. Select whether All Units are visible at any time or if they only appear once previous units are completed. Note, that because my students are frequently at different levels, I allow all units to be visible so that students can access just what they need. If you are creating a course with a certification or grade required, it may be beneficial to make them complete each area before moving on. Set User Access as Automatic. In our class, we are using a membership plugin or e-commerce plugin to grant access automatically when purchased (or using a free signup). If you are not integrating with any other plugins and want to have a course where you manually add students, then select Manual. This area displays the messages that users will receive as they go through the course including when they complete modules and quizzes, messages if they try to access content that isn’t available, and when quiz questions require an instructor to manually grade that question. You may keep the defaults or change as desired. Available fields for emails and other messages are displayed down the right side of the screen. Use these as needed to customize messages for your students. Enter the From Address. This is the From email that will appear in your email to students. For example, instructorname@yourcompany.com. Enter the From Name: This is the Name that will appear in your email to your students. For Example: Instructor Name. You can add details to help people recognize your email. For example Kim Shivler from How to Build an Online Course. Enter the admin email address. This is the address where you will receive administrative emails. This email is used when you have selected to Drip content to your users. Here you configure the email that will be sent when the unit is available to access. Note the use of the Email Notification Tags to customize the email. Select if you want to receive an email when a student completes a module. Select if you want the student to receive an email after completing a module, and if so accept the default or configure that email. Select if you want to receive an email when a student completes a course. Select if you want the student to receive an email after completing a course, and if so accept the default or configure that email. Select if you want the student to receive an email after completing a quiz, and if so accept the default or configure that email. Select the default or configure the email that the student will receive after completing the course. Select if you want the student to receive a certificate upon completion of the course. Note that if you are manually managing user access to your course, you may bulk add access to users on this screen, also. Click on the Save All Details Button once you are done. Your course will now appear in the course listing, and you can start adding Modules. In WP Courseware, modules serve as organizational sections within the course. These modules hold the actual lessons, known as units, that students will move through during the course. Note: Don’t add an order number to your modules. They will automatically be numbered based on the order you set them to display. You may continue to add some or all modules, at this point, or move on the creating the course units that will go within the module. In WP Courseware terminology, units are the lessons that will be taken during the course. To Add a Unit, from the Dashboard select Course Units > Add New. Adding a Course Unit in WP Courseware is the same as adding a blog post. Enter the title and your content using either the Text Editor or the Visual Editor. If you will drip this content, make your selection in the dropdown. You may select to have the content available on a certain date or on a specific interval after the course starts. If you have created a custom template, you may select this. For the purposes of our course, we will be using the default template that comes with WP Courseware. Select if it requires membership. For our purposes, it requires an Intro membership. Note that the settings for Custom Template, Content Drip, and Membership Requirements are found in the right sidebar. Depending on your configuration for managing course access, the steps for signing up to take a course may vary. For example, using a membership plugin versus a shopping cart may slightly different steps for signup and payment. Once you have registered for a course, when you go to the course page, you will see the listing of modules and units. Green checkmarks display next to the units that have already been completed. To take the next available unit, click on the link with the unit name. This will open the post for that lesson and display whatever text, graphics, video, and audio are part of that lesson. When you complete the lesson, you may Mark it Complete and move to the Next Unit. Note that if a quiz was assigned as part of this unit, you would have access to it at this point. WP Courseware provides one of the easiest ways to get a course up and running fast with many options for integrating with shopping carts and membership plugins.